It seems the great vaccinate debate is doing the rounds in the media. 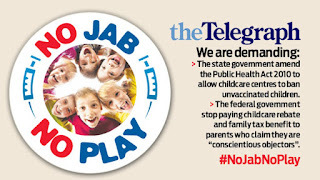 The Sunday Telegraph and Daily Telegraph have launched a pro-immunisation campaign to protect vulnerable children called #NoJabNoPlay. More than 3,000 parents have now signed their petition calling for restrictions in childcare for unvaccinated children. They are of the belief that it is one thing for anti-immunisation supporters to make a decision about the health of their own children, but it is different when that decision puts other children at risk. 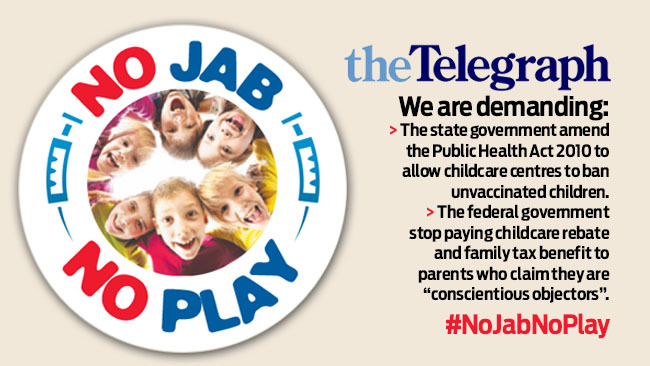 The NoJabNoPlay campaign is asking the state government to allow childcare centres to ban children who have not been vaccinated. It also calls on the federal government to withhold the childcare rebate from every parent who fails to immunise their children. Currently the federal government withholds childcare rebates for nonimmunisers, unless they have registered as a "conscientious objector". In the latest (and sadly last) madison magazine, Fiona McDonald has written a piece titled Vaccines. The Risks, The Rumors, The Reality. In her article, Fiona tells the story of several parents who have had different experiences with immunisations. One is of a seven year old boy whose parents didn't want him to be immunised and he got tetanus from a small cut. He was placed in an induced coma after suffering weeks of full body spasms. He was given a ten per cent chance of survival. He is now fully immunised and back at school. The article details that in some areas of Australia the number of people immunised reaches as low as 65 per cent. According to the article people question advice given to them by the government or doctors. These areas are shown to be more prone to outbreaks of measles, rubella and whooping cough. Dr Menzies, a researcher at Sydney University's National Centre for Immunisation Research and Surveillance of Vaccine Preventable Diseases was interviewed for the madison article and he thinks the miracle of modern medicine has, ironically, led many parents to forget just how dangerous diseases can be. The article goes on to talk about Online Misinformation, Are Vaccines Dangerous?, Misjudging Risk and How worried should we be? If you are interested in reading the whole article, it is on page 56 of the 100th madison magazine edition. I have to admit I didn't even think about not immunising our kids. Hubby never mentioned it to me either. When their vaccinations are due I just take them the doctor to have them. I couldn't imagine the grief of losing a child to a disease that they can be immunised against. It seems that this will be a debate for the ages though. Our kids are vaccinated and the decision was only made after a lot of research. Before I had children I widely researched both sides of the argument. And when I say research I mean I spent over two years thoroughly reading everything I could get my hands on. At the time I worked in alternative health care and had many resources available to me on both sides. What annoys me is that most people don't research and just take one side or the other. There are truths and myths and risks to both sides, but I don't believe that discriminating against or for vaccintated/unvaccinated children is the answer. 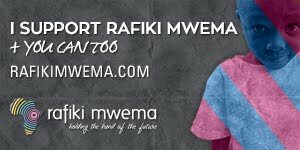 All I wish is that people would be given the information and opportunity to make their own informed decisions and not be vilified for it. I have to admit that after reading these articles that prior I was completely niave about it all. I think it is great that you researched so much and made a totally informed decision. Also, you are right that people should be given the relevant information to make an informed decision. Since having children no-one has ever offered me information on immunisation.